Bretts Circle is my ground up video training course that teaches the exact steps that I used to create my IM business. It explains how I got started and how I built it up from making only a couple hundred dollars a month to making over $500 on average per day. But Brett’s Circle is not really about me. Its about you. There is a lot of poor information out there that is really hurting people who are trying to start their own online / internet marketing business. That’s why I created Brett’s Circle. Because I really want to help people. It’s no nonsense, actionable training, with nothing held back. In fact I even created a special Facebook group for members to get personal assistance and ask me any questions they might have. 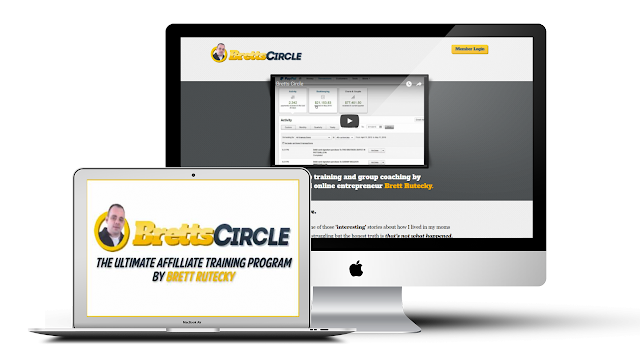 Bretts Circle provides training videos designed to help you succeed in Affiliate Marketing and Product Launching. Affiliate Marketing is promoting other people’s products for commission. Product Launching is creating, marketing, and selling your own product. Also included in Bretts Circle is a lifetime membership to a Facebook Group where you can post questions and quickly get answers from Brett. This group is only open to fellow Bretts Circle purchasers.